My mother is a liberal, a die hard Democrat, so her declaration that women should all just 'return to the home' was jaw dropping news for me. I suddenly imagined her with a flip hairdo, a poodle skirt, and a set of pearls. 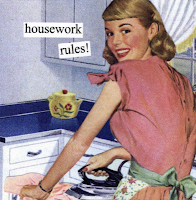 "Mom, most women today aren't fulfilled by being a full time homemaker. They want to do something besides attending to their homes. Work full time, go to school, or maybe even take a part time job." "Well, why? I just don't understand. In the 1950s women all got their hair done twice a week, entertained for their husband's boss, and got a heck of an allowance for managing the house. My mother was well taken care of. Sounds like a good life to me." "So women in the 1950's were happier? I find that hard to believe." I had watched enough shows to see that every woman of that era carried a martini glass and a bottle of pills while looking out the window to see when 'daddy' returned home. "As women, we have more opportunities than ever. We don't have to stay in the home now, if we don't want to." "But still, you go to work and the men maul you and act sexually aggressive towards you. Then men get promoted to better jobs just because they are men. What kind of world is that?" Trying to explain to her that there are now sexual harassment laws, that more women are employed then men, and that women can be anything they want now proved futile. "So what you are saying is that women are confused by what they want and aren't fulfilled by anything. If they were they would be happy caring for their homes." I love my mother, I really do, but I was feeling a vein in my head pop. "I'm just saying everyone needs to do what they want to do to find happiness. If that is being a homemaker, they should do that. If its working at Taco Bell, they should do that. If its owning their own company they should do that." "Don't you consider yourself a homemaker?" "I write from home, then I turn on my robot vacuum and throw a pot pie in the oven for my husband before he gets home. I'd hardly qualify myself as a homemaker." She just looked at me like she had won. I had to ask myself why I cared? I have great respect for homemakers. They do things I could never do. But hearing my mother call me one was unnerving. Then the epiphany came. She defines herself as a homemaker, and though I love my mother Ive never wanted to be anything like her. I didn't like being cast in the same play. While I was absorbing this revelation, she continued. "All I know is that I never wanted to be rich, or famous. I just wanted a home to take care of." I thought about all the homes we had lived in when I was a kid. All of the eviction notices posted on our doors. She had never really gotten her dream and I felt really sad. I had taken for granted the things she had always wanted: A husband who loved me and a home to take care of. Sure, it wasn't what defined me, but it was mine. "I'm sorry." I almost said, but I didn't. I walked away to my computer to try and make sense of it all. I didn't like her thinking. I still felt it was dangerous to say all women should do anything. But I wasn't wearing her lenses. In her 1950's world - the time of her childhood, before men hurt her and jobs disappointed her and my father died -women were free and cheerful and didnt have to worry. That's what men were for. She wasn't saying she really wanted that world again. She was just telling me she wanted to feel safe again. Maybe for Christmas I will buy her a vaccuum, or a broom. And she can clean up the pain of her past as she attends to the orderliness of her present.